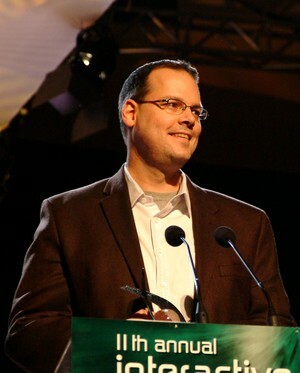 Ray Muzyka is a member of the Academy of Interactive Arts and Sciences. He spoke at the D.I.C.E. Summit® in 2003 and 2005. He works for Electronic Arts’ BioWare Corp.
A: That's like asking a parent to choose which child is their favorite – it's impossible to pick just one aspect of the job! I really enjoy being a generalist, helping out on a range of fronts – development, marketing, human resources, operations, and business, to name a few areas I work on at BioWare. Being able to work with such a talented group of people at BioWare to bring great stories to life is certainly one of the best parts of my job. Everyone is so dedicated to their craft and I'm honored to be in such great company. A: Playing games as my main hobby, and still practicing emergency medicine, I guess! I worked for quite a while as a medical doctor before I switched to game development full time, and I really enjoyed it – I didn't leave medicine because I didn't like it, but rather because I love video games even more. I also am a big fan of poker, and that's another hobby I really enjoy, playing in tournaments in particular. A: In the hard economic times right now, it's becoming increasingly important to consumers that they know they're getting their money's worth in the games they purchase. It's a continuous challenge for us as a developer to make sure we're still exceeding our fans' expectations, but for us it all comes back to our core value of quality in our products. Fans are smart and more connected than ever before, and they deserve great quality, and we certainly don't want to ever let them down. A: I actually can't think of a game I'm "jealous" of, but there are definitely many games out there that I certainly admire as a fan myself, and I have a ton of respect for a lot of other developers who take the art and craft of developing video games to new levels with every release – groups like Blizzard, Bethesda, Square Enix, Maxis, Irrational, Valve, Tiburon, DICE, Mythic, Nintendo, Infinity Ward, and many others. Whenever I see a game that does something innovative or delivers a great new experience that's never been done before, I'm always fascinated by that and I certainly encourage our teams at BioWare to try to learn all we can from it. I will say that it's tough sometimes to play other studios' games now, as the temptation to analyze and dissect them as I play them, thinking about how we can emulate best practices from other teams, makes it hard to step back and play them just for fun! A: At the moment, I wish things were better financially for the industry as a whole. We're all struggling to weather the current economic storm, but despite the challenges, we're still focused on making the best games we possibly can. Dragon Age: Origins is looking absolutely amazing, so I'm very excited for it to come out later this year. I can't wait until we can show our fans more on Mass Effect 2, and Star Wars: The Old Republic, plus the other unannounced titles we have in development at BioWare. A: BioWare’s success is measured by our pursuit and achievement of our three core values: quality in our products, quality in our workplace, and entrepreneurship. If we’ve delivered a game that our fans love, one that’s exceeded their expectations, and which they support us by purchasing and telling their friends about, that’s a great success for us. I’m lucky to have incredibly passionate, creative and talented people working with me at BioWare Edmonton, Austin and Montreal, all of them working really hard to create great games, so it’s important for me to provide our teams with the best working environment possible. Hence, if our teams are happy and passionate about their work, that’s also a great success for us. A: I’ve always considered games to be a true art form, a commercial art form that engages people on an emotional and deep visceral level in a way that no other art form does. Games entertain, educate and connect people, and any art form that can do that is very important – and more and more people play games on a range of diverse platforms for entertainment every year. Moreover, games allow you to be the actor at the center of the experience, and the director of that experience as well – and with the advent of user-content creation tools, to be co-creator of the experience too – that’s a pretty amazing combination, one which I think has the potential to be one of the most emotionally engaging forms of art. A: I love hearing from BioWare’s audience of fans about their experiences playing our games. Every point of feedback we receive allows us to improve our craft. I’ve heard consistently that our fans get really attached to the worlds and characters we’ve created, and I am always excited to hear about the “wow” moments they’ve had during one of our games – you know, those moments which send a chill down the back of your neck? It’s an amazing feeling to know that we’ve connected successfully with our fans on an emotional level, because that’s what our story and character-driven games are all about: helping us achieve our vision at BioWare of genuine emotional engagement. I know from personal experience as a gamer myself that those kinds of experiences stay with fans long after they finished a game, and this is a great legacy to have – but at the same time I really believe our best work is still ahead of us. My preference at BioWare would actually be to stay behind the scenes and let our teams and games take the spotlight, but I also recognize the importance of being a spokesperson – an evangelist really – who’s passionate about our studio and our products. It’s a real honor for me to work with the talented teams at BioWare. In the end, if BioWare has an enduring legacy, a world-wide respected brand built around the unrelenting pursuit of quality, that’ll be more than enough for me to be happy. A: Absolutely! At BioWare, we encourage all our developers to play as many games as they can because it’s very important to have that familiarity with the industry, and passion for your work. We learn a lot from the games we play from our competitors – as fans ourselves, we learn what works well, and what doesn’t – and we incorporate what we’ve learned into making our own games even better. In fact, sometimes we even replay games from as far back as the 80’s or 90’s for reference, which goes to show that just because a game is old doesn’t mean there’s not something to still learn from it. A: Gaming technology is always advancing by leaps and bounds, which enables content creators to create more diverse, immersive, accessible experiences, and at the same time games are more and more ‘connected’ via online modes like multiplayer, post-release content, and online social communities. I think these are the two key themes that empower more emotionally engaging experiences in games for both new and existing consumers. Dragon Age: Origins is the spiritual successor to Baldur’s Gate, which came out over 10 years ago, and it’s incredible to see how far we’ve come since then, thanks to all the advances in technology and the continuous evolution and improvements in content creation and online community development. With Mass Effect 2 we’re building on the experience of Mass Effect to take it all to a new level, focused around compelling story and high-intensity action. With The Old Republic we’re building on the best of breed features of existing massively multiplayer games and working hard to add a brand new type of storytelling into the MMO space. For me, it all leads to the confirmation that games are indeed art, and that great games have the potential, like great art, to make players feel truly emotionally engaged.